In my area you can see a lot of ravens and crows and the population grew over the last decade, so they really became a plague in some spots. But nevertheless I love those clever birds with their shiny black feathers(as long they leave the smaller birds and their nests alone). 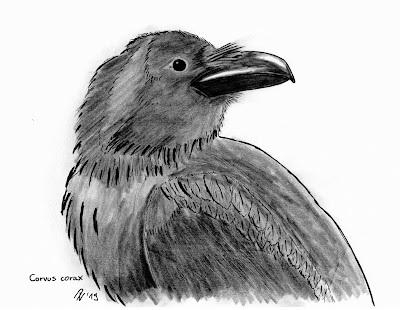 So it was time for me to extend my collection of animal drawings and draw a raven, a Common Raven (Corvus corax) to be precise. I used my Faber CAstell PITT ink pens and a black colored pencil, as I had no carbon pencil or drawing charcoal on hand. So here's the original drawing. I usually copy and scan my original to make sure I have a copy, if the original gets lost. 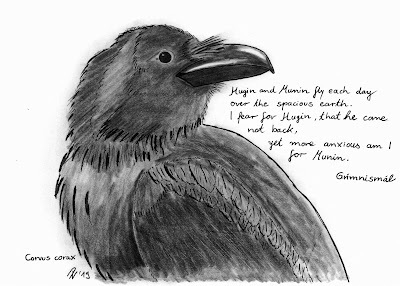 I took a print and added a passage from the Grímnismál, a song in the Poetic Edda, where Odin speaks of his ravens Huginn (thought) and Muninn (memory). I'm als a big fan of the art of Sue Coleman and am fascinated by her combination of real life animals with the art and the totems of Northwestern Native American tribes. 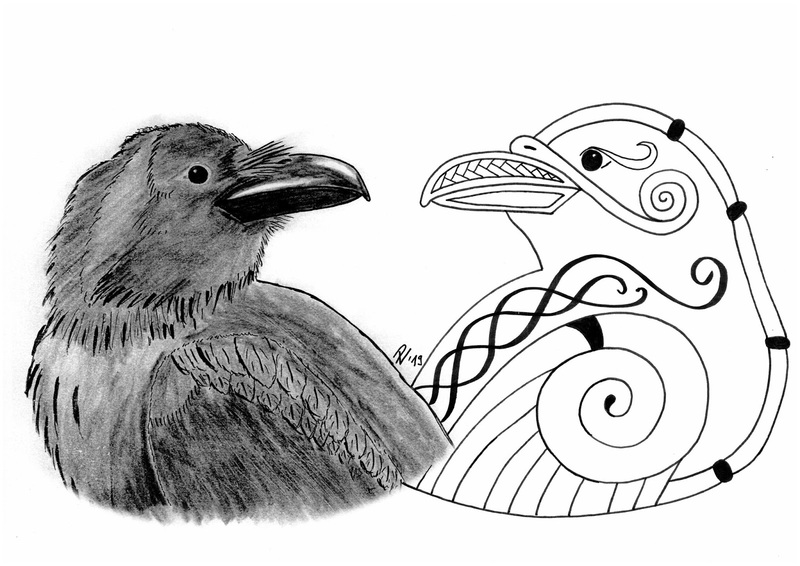 I always wanted to try something similar, so I took my raven and added a mirror image of it with some old Norse designs and scrolls. Still a lot of work, until I'm really pleased with my work, but it is a beginning. I think I'd love to make something like that with a wolf I drew in 2017. I hope you enjoyed my drawing and I'm sharing this with PPF. Have a look at all the wonderful pieces of art shown by the other participants. What a fabulous study with the pitt pen you have captured it's stare perfectly. I'm not familiar with Sue's work but I can see the admiration with the wonderful Totem art. A beautiful piece. Thank you! Yes, they can be a royal pain early in the morning. Marvelous raven drawings. I like that it is not so angry looking as often see. Love it! I was worried about that fact, as I thought my raven has a face much too friendly. ;) Thanks! great looking raven art! I find animal spirits so interesting. Happy PPF! Me, too. I already have huge collection of animal drawings and thought about taking some of them and add a mirror image like I did here. Beautiful artwork! The geese here are so noisy of late. We have only few geese here, but I can imagine how noisy they can get in big numbers. Lovely drawings. Thanks for introducing me to Sue Coleman's work, I'd not come across her before. Thank you. I came across her work in the house of a friend. She had two of her art cards framed and hanging on her wall. 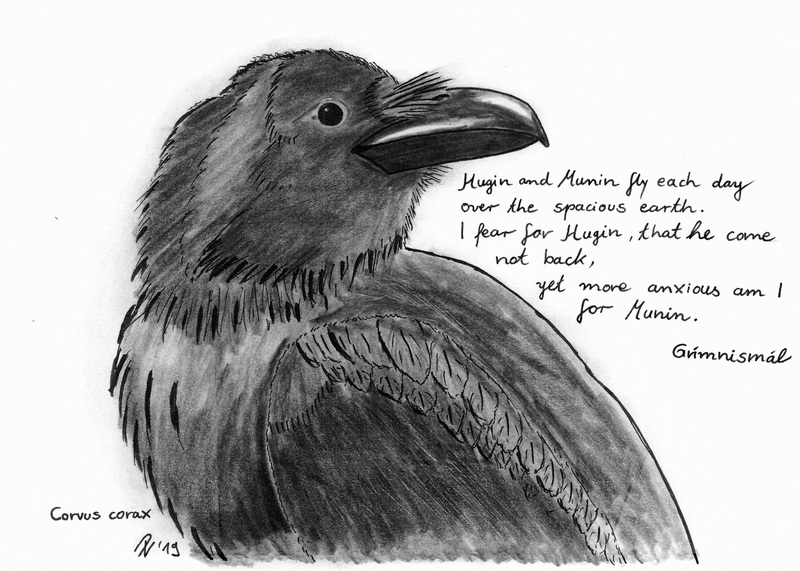 Raven is one of my favourites birds in art and literature. Your painting is wonderful, and the addition of the quote is fabulous. Ravens are made for the celtic drawings and yours is really lovely! Thank you! Have a nice weekend, too. Thank you! I enjoyed making it. As one who adores the crows and ravens, I can love this artful expression too. Beautiful!